ZipCentral is a dated and simple file manager program which deals mainly with file archives compressed using the ZIP format. It is very easy-to-use and offers several options. 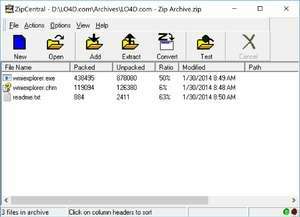 The basic commands of ZipCentral are to create self-executing archives, repairing damaged ZIP files and creating ZIP archives from files and folders. The interface of this file archiver is easy, while fully supporting drag-and-drop. Version 4.01 is a freeware program which does not have restrictions and it's free so it doesn't cost anything. For security reasons, you should also check out the ZipCentral download at LO4D.com which includes virus and malware tests. Additional screenshots of this application download may be available, too. ZipCentral has a presence on social networks.